Alice’s ‘Beaded’ collection is by far her most successful. The technique used in this collection is called ‘granulation’. Each of the tiny little granules are handmade by melting a small piece of silver, then grouped together and soldered to give a random bobbly effect, many have said ‘resembling diamonds’. As you can imagine the original prototypes took weeks to make, but the overall effect is truly sparkly. Inspired by random pebbles on the beach. 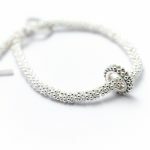 A beautiful contemporary and stylish silver bead bracelet, made up of hundreds of tiny decorative beads strung together with a silver beaded ring charm. This, along with the pebble version, is one of my best sellers. 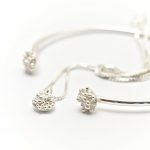 This really is gorgeous bracelet that makes a fabulous present for all ages, however you will be needing one for yourself too! Necklace to match available, see separate entry. These enormously popular earrings are now available in 9ct gold! They form part of the 'Beaded' collection inspired by random pebbles on the beach. 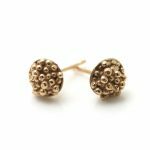 A great everyday little gold stud that you are certain not to regret. This is still the necklace that I'm most proud of! Made up of 14 fluid sections, it looks like one continuous flow of random granules and has a truly sparkly finish, almost diamond like! The necklace is an elegant statement piece that is sure to compliment any special outfit and without doubt turn a few heads! 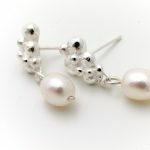 A unique pair of silver earrings made from clusters of silver granules with a creamy white freshwater pearl or moonstone drop. Inspired by pebbles on the beach this is an elegant edition to the beaded collection. These earrings really sparkle due to the contrast in finishes, from the matt white in between the silver balls to the high polish on the outside. Suitable for day or evening wear, depending on your mood! 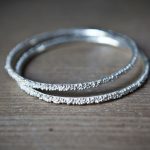 A elegant silver cuff with a gorgeous granular beaded top. 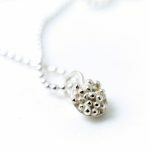 Another piece in the Alice Robson 'Beaded' collection inspired by clusters of pebbles on the beach. 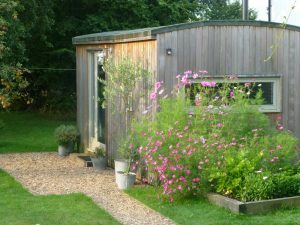 The tiny silver balls were individually made and soldered together (a labour of love) on the original master, giving a wonderfully sparkly finish. The beaded section sits on top of an oval (in cross section) cuff making it extremely comfortable to wear. 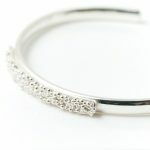 This is a really stunning bangle with an open back. Its simple to wear and has bags of style! 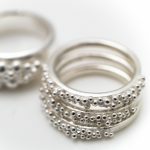 The random silver granules are inspired by clusters of pebbles on the beach and form part of the 'Beaded' collection. 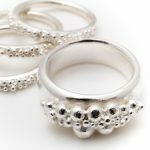 The finish is matt white between the granules and highly polished on the outside, giving the ring a truly sparkly finish. 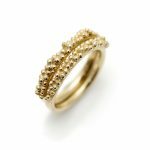 Looks great worn with a single beaded narrow ring (see my full range) or on its own. This is a really unusual and unique piece. The inside of the ring is curved making it extremely comfortable to wear. If you don’t already know your size then pop into your local high street jewellers and ask them to measure your finger. 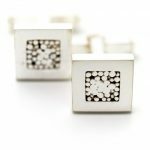 These contemporary square cufflinks have an interesting beaded detail. They have a simple movable bar fitting making them very easy to put on.